John Entwistle. George Harrison. So how come itís the utterly coolest-by-far members of some of our all-time favorite bands who seem to be departing far, far too soon of late? Now Maurice Gibb of the Bee Gees has gone truly horizontal on us as well. And, like Messrs. Entwistle and Harrison, Maurice in many ways did appear to be "the quiet one" amongst his musical company, but really only to those who werenít listening closely enough. On the surface certainly overshadowed by twin brother Robin's other-worldly vibrato (not to mention Barry Gibb's wholly Kennedyesque jumbo pin-up persona), Maurice was in truth the literally unsung hero behind the Bee Gees' multitude of stage, studio, and especially compositional achievements. For example, a la the so-called Quiet Beatle, his voice was always the key, if seemingly "ghost" harmony in the Gibbs' intricate three-tiered vocal blend. Plus Maurice's sense of humor (off- and most pointedly back-stage as well) was every single inch the absurdly dark equal to that of The Who's wickedly bottom-ended Ox-man, as even surface exposure to the Bee Gees' vast library of unreleased "party tapes" will certainly reveal. So without him I suppose, Barry and Robin can always sing like Everly Brothers of course. But won't the Gibbs' legendary Three Stoogeplay be reduced to mere Martin & Rossi without Maurice's sweetly subtle Larry Finery? I fear such eventualities are almost too tragic to even contemplate. 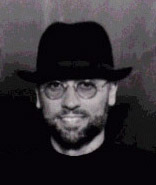 On a less ominous tack, it is interesting to consider that sly-fox Maurice remained the only Gibb to never offer a full solo album up for public consumption (though not for lack of trying: When the group first split beneath a hail of chart-topping rancor in the late Sixties, Maurice launched sessions in earnest alongside then brother-in-law Billy Lawrie and even Ringo Starr for a long-player to be prophetically titled "The Loner." Check with your preferred file sharer to sample for yourself all the wily wonders well underway...before Barry and Robin came calling with what was to become that first of several Bee Gee comebacks, "Lonely Days"). And on the subject of classy career revivals, when 2001's glorious "This Is Where I Came In" unexpectedly put those Gibbs right back upon a plateau every note the equal of their mid-Seventies and even mid-Sixties glory daze, near complete credit for this sobering turn of fortunes was duly awarded to Maurice's greatly increased role in what, alas, may very well be the Bee Gees' swansongs. On the heels of this latest rebirth, Barry and Robin were reportedly dedicating every waking hour to keeping their physical and vocal chops at tip-top, road-ready level. But Maurice? Why, he was, so characteristically, consumed instead by a newfound passion for the utterly unmusical pursuit of Paintball combat, and his Royal Rat Rangers (I kid you not) team had just made the semi-finals at Londonís Crystal Palace World Campaign Cup competitions! So it only remains to suggest at this sad juncture that perhaps the entire world could benefit greatly if we all just took some time out as soon as possible for one great big round of global Paintball in Maurice's matronly, peace-loving honor. Because you just know he would be the first to gamely join in, with a spit and a grin, to fill as only he could that irreplaceable hole in our intricate harmonic fabric. Godspeed, Maurice. You were far from a Loner in this world.